Warm rose gold diamond cluster earrings for everyday elegance or to add sparkle to a holiday event. These custom made to order solid 14k or 18k gold diamond trio dangle earrings are clustered together in a tiny triangle to look both modern and classic. These would be fabulous for a bride. 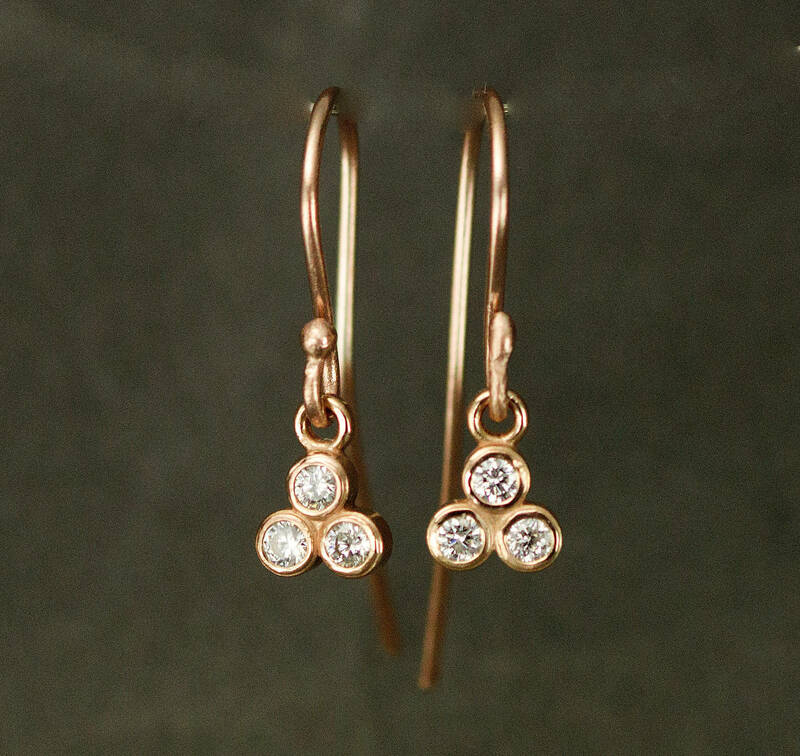 In the earrings pictured, diamonds are set in rose gold bezel settings and have matching rose gold handmade ball end ear wire hooks, yellow and white gold are also available in 14k. 18k yellow gold are pictured in the second photo, white gold also available in 18k. The diamonds each measure 2mm (6 diamonds .18 carat per earring) and are from a Kimberly certified supplier. These earrings can also be made to order with full cut Moissanite, or white sapphires with great sparkle. Other colored diamonds, sapphires and colored stones are available as a custom request. Diamonds: 6 diamonds total, each 2mm in diameter, .03 carats, SI1 -SI2 clarity, G-H color, 1/5 ctw per pair. These diamonds meet all ethical and environmental standards, straight from the mines of Canada. Diamond details: from the Stuller Canadian collection. Please check measurements before ordering against a ruler with a mm scale. Photos are taken with a macro camera lens to enlarge and show detail. If you have a nickel allergy or sensitivity and love white gold- ask me for pricing for nickel free palladium white gold ear wires. For hygienic reasons, I do not use a live model for any earring photos. Please note: Each pair of studs is custom made to order after purchase, these are not in stock and ready to ship. Please be sure to read my policies on returns and exchanges and ask any questions before purchase. All metals are 100% recycled and refined in the U.S. This item will ship in packaging suitable for gift giving. I provide a gift box, a drawstring pouch. Inside your pouch I include a square of Sunshine polishing cloth to get that extra sparkle before wearing. All gold used is 100% recycled material. "By purchasing you agree that you have read and agreed to all my seller policies on returns and exchanges"
The earrings are lovely! Thank you!